Yesterday I told you a little bit about Bill Peet and today I wanted to share some of his books that we've either collected or borrowed from the library to read and enjoy (until we can afford to officially add them to our own home collection, you understand!) 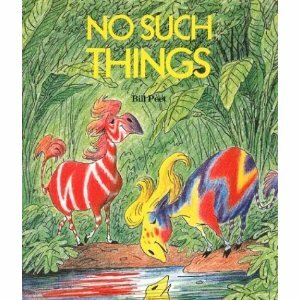 In yesterday's post I provided a list of the 36 children's book titles that Peet produced. Today I'm offering a sampling of his work. 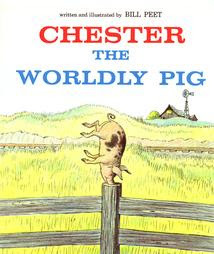 When I purchased a copy of Chester the Worldly Pig I had no idea that it would be so popular with my boys. They both request it being read to them on a fairly frequent basis. Bookworm2 (age 2 1/2) has been known to walk around the house with this book tucked under his arm. Sometimes I can't really tell you what the appeal is to a certain book - such as now - but I do know that it is incredibly popular. And incredibly long for a two and a half year old so I am left to chalk this up to Peet's storytelling abilities! Chester tells the story of a pig who wants more than anything to be a part of a circus. So he practices standing on his snout in an attempt to gain the attention of circus folk. He isn't noticed right away but eventually does land a role in the circus that he doesn't ultimately enjoy. As it turns out, standing on his snout is not the most amazing thing about Chester. I almost can't bear to tell you about Chester's unique feature but the title does give you some clue. Read it for yourself. Bookworm2, our resident train fanatic was delighted when I pulled The Caboose Who Got Loose out of the library basket last week. This book tells the story of Katy Caboose who didn't want to be behind the train any longer but wanted to be free and alone. Katy ultimately gets her wish in a rather unique plot twist. The thing that I love about Peet's stories are that they continually catch me by surprise. They do not follow a regular formula and you can't ever quite guess how the stories are going to play out. You might think you know, but you never really do. It makes them entertaining reads because they are so unpredictable while still being stories of substance. 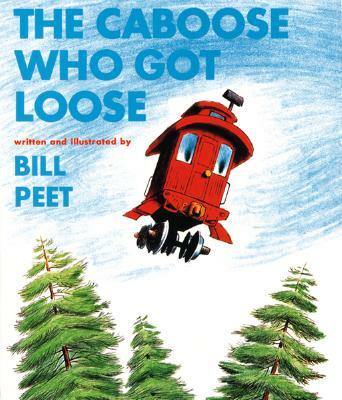 The Caboose Who Got Loose is also told in rhyme, as many of Peet's works are, which - in my opinion - can easily pit him against Suess, giving Suess a run for his money! Peet is a bit more refined and geared towards older readers though, perhaps. But that makes him a natural author to progress to on the reading scale. 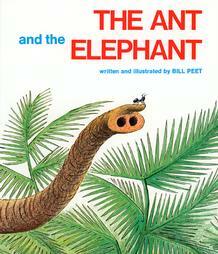 My personal favorite, and the title I'll end with, is The Ant and the Elephant . This one is also a part of our home library and I'm glad of it! It tells the story of a group of jungle animals who all need a little bit of help getting out of some tough scrapes but are too hoity toity to help those around them. Only the ant and the elephant prove useful to jungle society as they take time out of their day to work together to help both each other and the other animals out. It's an awesome story of teamwork and friendship and a good reminder that it is important to treat others as you would have them treat you! Love it. There are many more titles I could list but I'll step there and let you explore Bill Peet and his work for yourself! Again, I don't think you'll regret it. I hope there comes a time in my life when I find the need to say "The caboose who got loose." What a great title. I can't believe we've never borrowed him from the library...and have been content with our own titles. Next visit...for sure! How Droofus the Dragon Lost His Head was the first LONG (so very LONG) book for M at age 2, too. Not ideal when you expect to read for less than 5 minutes so child can take her nap...but such fun. You're right about the lack of "formula" which we all appreciate! I'm loving these Peet posts -- he's a big fave around here, as you know! Little known fact: Bill Peet worked on both the art and the story in Disney's The Sword and the Stone. Second little known fact: Bill Peet had a pet capybara - which explains the Wumps.